For users of the company’s devices, the biggest change will be the introduction of a unified data privacy iconography, which now shows up alongside detailed information about how Apple uses personal data for its various first-party services. “Apple believes privacy is a fundamental human right,” the company will tell every user the first time they turn on their devices after the update, “so every Apple product is designed to minimise the collection and use of your data, use on-device processing whenever possible, and provide transparency and control over your information”. 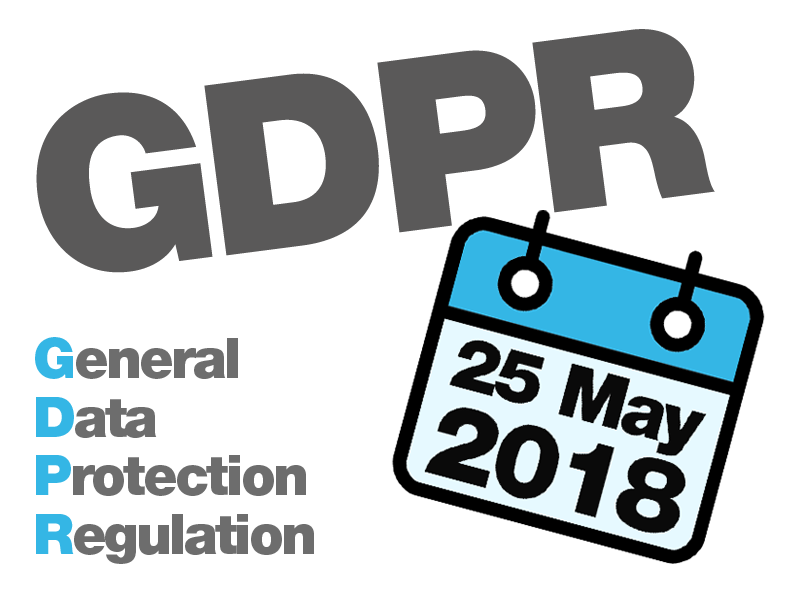 Although the new features are prompted by GDPR, they are rolling out to users worldwide, and the company proudly notes that it has not had to change any of its software to comply with the new regulations. Unlike competitors such as Google, who operate on the principle that large scale data collection bestows an advantage in areas such as machine learning and transport planning, Apple has repeatedly argued that it has a responsibility to minimise data collection. In May, shortly before GDPR takes effect, Apple will also update its website to make it easier for users to exercise four key rights granted by the regulation: getting a copy of their data; requesting a correction to their data; deactivating their accounts; and deleting their accounts. The company sees an opportunity to distinguish from competitors there too: deactivation, in particular, is a much stronger implementation than in other platforms. It removes the user’s information from all aggregated data stores, isolating their accounts but stopping short of deleting them. Frisk is the same researcher who previously discovered a way to steal the password from virtually any Mac laptop in just 30 sec by exploiting flaws in Apple’s FileVault disk encryption system, allowing attackers to unlock any Mac system and even decrypt files on its hard drive. The discovery is the latest issue surrounding Meltdown and Spectre patches that were sometimes found incomplete and sometimes broken, making problems such as spontaneous reboots and other ‘unpredictable’ system behavior on affected PCs. According to Frisk, the problem with MS’ early Meltdown fixes occurs due to a single bit (that controls the permission to access kernel memory) accidentally being flipped from supervisor-only to any-user in a virtual-to-physical-memory translator called PLM4, allowing any user-mode application to access the kernel page tables. The PML4 is the base of the 4-level in-memory page table hierarchy that Intel’s CPU Memory Management Unit (MMU) uses to translate the virtual memory addresses of a process into physical memory addresses in RAM. The correctly set bit normally ensures the kernel has exclusive access to these tables. “The User/Supervisor permission bit was set to User in the PML4 self-referencing entry. This made the page tables available to user mode code in every process. The page tables should normally only be accessible by the kernel itself,” Frisk explains in his blog post. To prove his claim, Frisk also provided a detailed breakdown and a proof-of-concept exploit. The issue only affects 64-bit versions of Windows 7 and Windows Server 2008 R2, and not Windows 10 or Windows 8.1 PCs, as they still require attackers to have physical access to a targeted system. Also since the PML4 page table has been located at a fixed memory address in Windows 7, “no fancy exploits” are needed to exploit the Meltdown vulnerability. Once read/write access has been gained to the page tables, it would be “trivially easy” to gain access to the entire physical memory, “unless it is additionally protected by Extended Page Tables (EPTs) used for Virtualization,” Frisk said. All attackers have to do is to write their own Page Table Entries (PTEs) into the page tables in order to access arbitrary physical memory. Frisk said he has not been able to link the new vulnerability to anything on the public list of Common Vulnerabilities and Exposures. 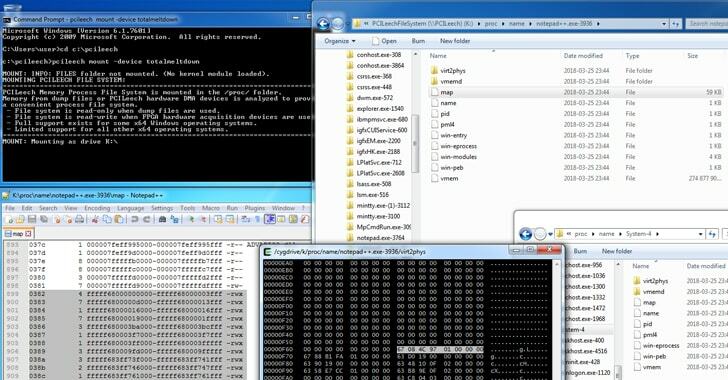 He also invited researchers to test the flaw using an exploit kit he released on GitHub. 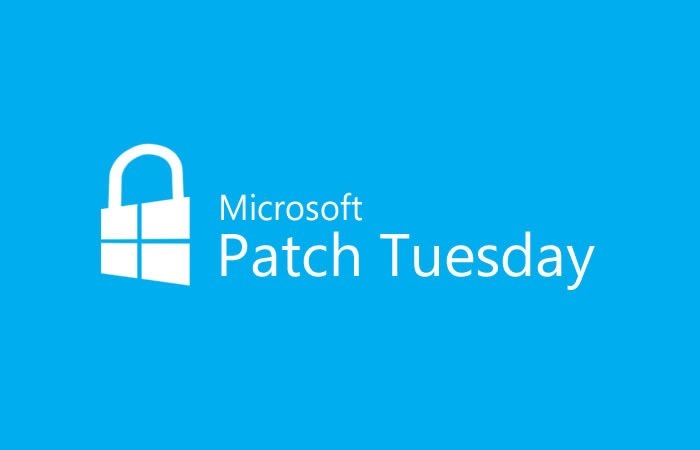 The issue with the Microsoft’s Meltdown patch has been fixed by the company in its March Patch Tuesday, so all admins and users of Windows 7 and Windows 2008R2 are strongly recommended to update their systems as soon as possible. The 27 vulnerabilities reported by researchers include 9 security flaws assessed with a High severity rating, 15 bugs considered Medium risk, and 3 issues with a Low severity rating. Google rewarded the researchers over $34,000 in bug bounties, but hasn’t provided details on all payouts in the published advisory. The most important of the addressed bugs are two High risk use after free in Flash (CVE-2018-6058 and CVE-2018-6059). Both were reported by JieZeng of Tencent Zhanlu Lab in August 2017 and were awarded a $5,000 bounty each. Google also addressed a Use after free in Blink (CVE-2018-6060) and a Race condition in V8 (CVE-2018-6061) – two High severity flaws awarded $3,000 each –, as well as a Heap buffer overflow in Skia (CVE-2018-6062) – awarded $1,000. Other High risk issues resolved in Chrome 65 include two incorrect permissions on shared memory bugs, one Type confusion in V8, and one Integer overflow in V8. The most important of the Medium risk issues was CVE-2018-6066, a Same Origin Bypass via canvas that was awarded a $4,000 bounty. Other Medium severity issues addressed in this release include Buffer overflow in Skia, Object lifecycle issues in Chrome Custom Tab, Stack buffer overflow in Skia, CSP bypass through extensions, Heap buffer overflow in Skia, Integer overflow in PDFium, Heap buffer overflow in WebGL, and Mark-of-the-Web bypass. 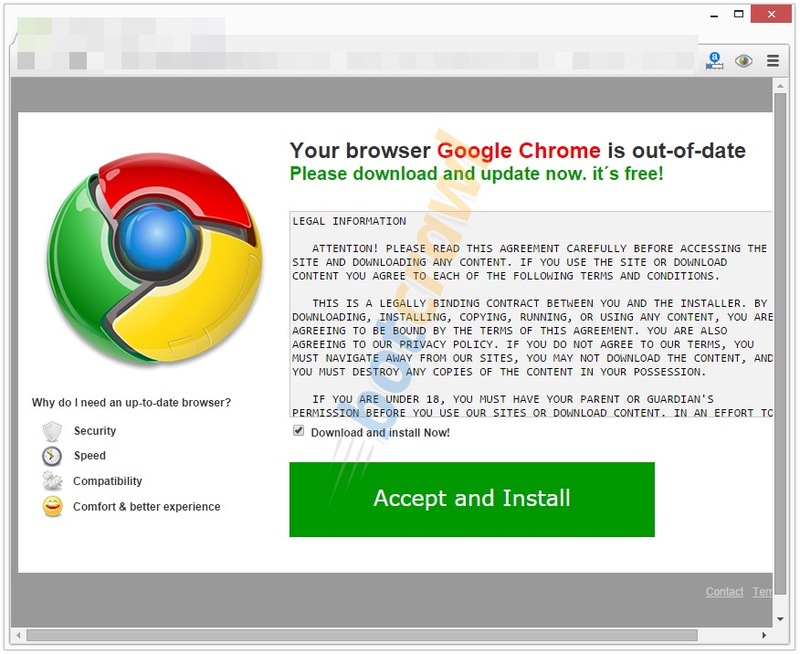 Google also addressed an overly permissive cross origin download, incorrect handling of URL fragment identifiers in Blink, a timing attack using SVG filters, URL Spoof in OmniBox, Information disclosure via texture data in WebGL, and Information disclosure in IPC call. The three Low risk bugs resolved in the browser include XSS in interstitials, circumvention of port blocking, and incorrect processing of AppManifests. The new application release is available for download as version Chrome 65.0.3325.146 for Windows, Mac and Linux computers. Chrome for Android has been updated as well, now available as version 65.0.3325.109. The need for such services is becoming clear, as ISPs are starting to break net neutrality. AT&T is leading the destruction of net neutrality. Despite its claims to the contrary, AT&T is preparing to implement fast and slow lanes. Its “free” lanes are with the Sponsored Data plan for AT&T video services such as DirecTV Now. These changes foreshadow more drastic damage to net neutrality. Under the FCC’s new rules, for example, an ISP could charge you more if you watched Netflix instead of Hulu. Or, it could slow your Sling TV video while allowing YouTube TV to run at full speed. Don’t think ISPs would do this? Think again. It’s already happened. In 2012, AT&T banned Apple FaceTime on its networks. And, in 2014, Verizon slowed down Netflix traffic. In addition, the Electronic Frontier Foundation (EFF) has pointed out that you can expect your ISP to sell your data to marketers; hijack your searches; snoop through your traffic to add yet more ads; and inject undetectable, non-deletable tracking cookies in all of your HTTP traffic. These are all things ISPs have done before — and free of regulation, they’ll do even more of it. What can you do? Turn to a VPN. 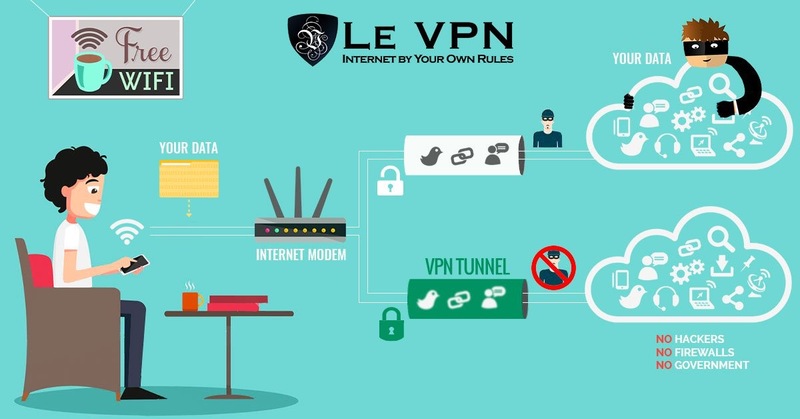 With a VPN service, your ISP can’t see your your network traffic, so it can’t tell where you’re going or what services you’re using. Verizon, which owns Yahoo, won’t be able to tell, for instance, that you’re using Google for your searches. And, of course, since your ISP can’t read your traffic, it can’t sell your information or place targeted ads in it. Your ISP should — note I said should — treat your VPN traffic as ordinary traffic. In some countries, notably China and Russia, VPNs are tightly controlled or banned. It’s possible ISPs or President Donald Trump’s government may yet try similar things with US VPNs, but they haven’t tried this yet. In the meantime, some people have already turned to VPNs to protect themselves from their ISPs. Ariel Hochstadt, former Gmail marketing manager and present internet entrepreneur, noticed that just the FCC’s first moves to kill off net neutrality in April 2017 caused a 170-percent increase in VPN sales. In an interview, David Gorodyansky, CEO of Anchor Free, the parent company of the HotSpot Shield VPN, said he saw a spike in VPN sales after the FCC’s anti-net neutrality moves. NordVPN claimed, “A VPN service gives access to the internet without throttling and censorship – the way it’s supposed to be.” It’s right. This is allegedly due to a security blunder in which the private keys for said certificates ended up in an email sent by Trustico. Those keys are supposed to be secret, and only held by the cert owners, and certainly not to be disclosed in messages. In the wrong hands, they can be used by malicious websites to masquerade as legit operations……Unless the affected certificates are replaced in time, visitors to websites using Trustico-sold HTTPS certs will be turned away by their browsers, due to the digital certificates being revoked……The whole situation is a mess, and possibly the result of a turf war. Here’s what we’ve managed to ascertain. Trustico, based in Croydon, UK, touted SSL/TLS certificates, which are used by websites to encrypt and secure their connections. It resold certs from the Symantec brand umbrella: Symantec, GeoTrust, Thawte, and RapidSSL. This umbrella is now owned and operated by DigiCert……If you wanted to buy, say, a RapidSSL-issued certificate, you could do so via Trustico. The HTTPS cert ultimately leads back, along a chain of trust, to DigiCert, a root certificate authority trusted by web browsers and other software. In turn, the website presenting the Trustico-sold cert is trusted, its traffic secured using encryption, and the reassuring green padlock is displayed in visitors’ browsers. Why are the certificates being revoked? On Twitter, Rowley continued: “I’ll likely be posting the private keys later once people have a fair chance to replace their certificates … The allegation of compromise, keys compromised, and request for revocation all came from Trustico.”…….Before you raise an eyebrow too high, by posting the private keys, Rowley plans to disclose self-signed certificates, produced using the private keys, to prove the secret information was sent to DigiCert without revealing the actual information in public. Some have already popped online as proof DigiCert received the secret keys from Trustico. Trustico requested revocation of their Symantec, GeoTrust, Thawte and RapidSSL certificates, claiming the certificates were compromised. When we asked for proof of the “compromise,” Trustico did not provide details on why they were requesting the immediate revocation. Trustico’s CEO indicated that Trustico held the private keys for those certificates, and then emailed us approximately 20,000 certificate private keys. When he sent us those keys, his action gave us no choice but to act in accordance with the CA/Browser Forum Baseline Requirements, which mandate that we revoke a compromised certificate within 24 hours. As a CA, we had no choice but to follow the Baseline Requirements. 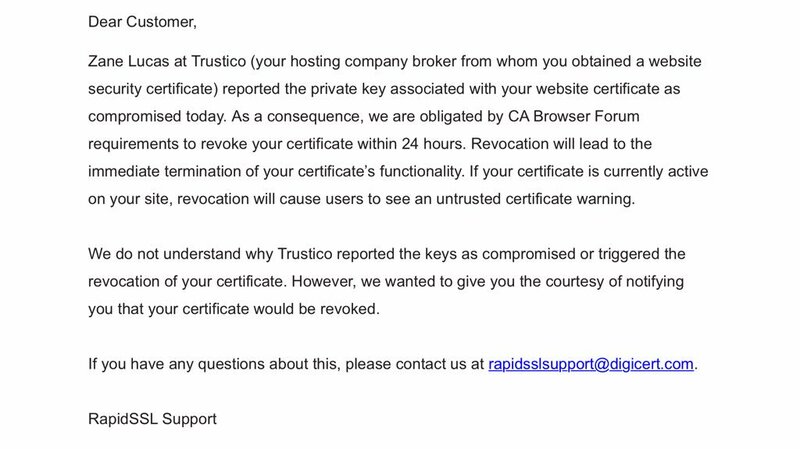 Following our standard revocation process, we gave notice via email to each certificate holder whose private keys had been exposed to us by Trustico, so they could have time to get a replacement certificate. We asked the Brit biz for comment, and had yet to hear back at time of writing. However, posting on Mozilla’s security policy newsgroup, Trustico product manager Zane Lucas was clearly upset that DigiCert sent out the above alert…….”We didn’t authorise DigiCert to contact our customers and we didn’t approve the content of their email,” wrote Lucas. “At no time had any private keys been compromised, nor had we ever informed to you that any private keys had been compromised. During our many discussions over the past week we put it to you that we believe Symantec to have operated our account in a manner whereby it had been compromised. Your usage of the word compromise has been twisted by you to your benefit and is absolutely defamatory.”…….To put this in context: Trustico was fed up with using Symantec certs, and on February 13, it formally abandoned the umbrella of brands – ahead of Google Chrome and Mozilla Firefox officially distrusting the certificates due to past security fumbles by Symantec. Trustico said it had complained privately to Symantec of long-running concerns over the security safeguards on Symantec-branded of certificates, hence Lucas’ reference to its Symantec account. Recently we wrote to you to let you know that we are no longer offering Symantec, GeoTrust, RapidSSL and Thawte branded SSL Certificates. Unfortunately, Google Chrome has decided to distrust these SSL Certificates. It’s important to us that you SSL Certificate continues to function as normal, and not be compromised by the distrust of the Symantec brands. It is now required that you replace any existing distrusted SSL Certificate with one that is trusted by all web browsers. Rest assured, there hasn’t been any type of compromise of our systems. However, Symantec brands will cease to function correctly due to Google Chrome’s decision to distrust them. Recently DigiCert acquired the Symantec SSL Certificate division and subsequently an e-mail was sent by DigiCert to some of our SSL Certificate customers advising of the revocation of their distrusted SSL Certificate. We didn’t authorise this e-mail to be sent and had specifically disabled it within the DigiCert system. We understand that the e-mail sent about your distrusted SSL Certificates may be confusing. It’s important that you take the opportunity to replace your SSL Certificate as soon as possible. We’re providing free replacement of affected SSL Certificates. To enable a free replacement, you’ll receive an e-mail report today if you have affected SSL Certificates. Your report will contain a unique coupon code for each affected SSL Certificate. When you replace your distrusted SSL Certificates using your unique coupon codes you’ll receive extra validity free of charge. If you have any questions please feel free to reply to this e-mail. In the two weeks since it was first discovered, researchers said that the malware has been found on over 800 mostly small business websites running the CMS platforms WordPress, Joomla and CodeIgniter. According to SiteLock, which found the malware, it is unique because the malware is both encoded and formatted to look like a legitimate ionCube file. IonCube is a commercial PHP scrambler that turns text-based PHP files – used to create dynamic content on websites – into an undecipherable code often to hide the intellectual property associated with licensed PHP files. Weston Henry, lead research analyst at SiteLock, said the ionCube Malware is similar to malicious base64 encoded PHP eval requests that target website PHP functions and hide inside rogue CMS plugins. Eval is a PHP function capable of executing arbitrary PHP code and often used by hackers to create website backdoors. “This is particularly hard to identify, especially for any site that might already be using ionCube services,” Henry said. 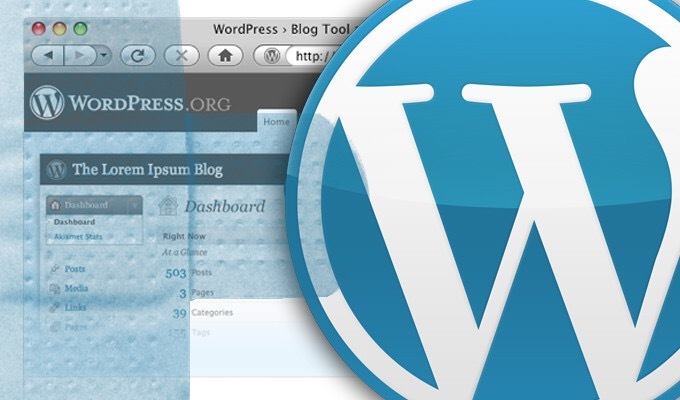 Researchers said samples identified were named “diff98.php” and “wrgcduzk.php” and found in the WordPress core directories. Upon further inspection, malicious ionCube file code contain subtle differences such as a bogus “il_exec” line rather than the legitimate “_il_exec” line. “From our findings, there’s a reference to the ioncube.com domain name in some form or another in every legitimate ionCube file, but it is not present in the fake files. Also notice that the fake file has a code block after the PHP closing tags, much like the legitimate ionCube file. But unlike the real file, this code block consists only of alphanumeric characters and newlines,” according to an upcoming SiteLock blog outlining its research.